Customisable beads that deliver antibiotics and cancer-fighting drugs when implanted in the body have been developed by researchers at Louisiana Tech University. The implants, which use biomedical and nanosystems engineering, are one of a growing range of medical applications for 3D printing. Three-dimensional printing — in which objects are built up layer by layer using materials such as polymers and metals — is bringing sweeping changes to the medical world. Implants and prosthetics can be tailor-made for individual patients, while additive manufacturing, as 3D printing is also known, has broad applications in reconstructive surgery. 3D scanning means surgical procedures can be tested out on a computer. By printing models of damaged bones or body parts, implants can be designed to fit exactly, while 3D cutting and positioning guides give surgeons greater accuracy in the operating room. Meanwhile, customisation is moving into the realm of personalised medicines. For example, doctors could formulate drugs to treat the conditions of individual patients and “print” them in the clinic. This idea is being pursued at Nottingham University in the UK, where a team of researchers is working on creating 3D-printed pills containing several ingredients. Various layers of drugs are printed and coated in materials that allow each to be released at a different time. This could make life easier for older people and patients with several conditions who need take large numbers of pills throughout the day. Researchers even foresee a time when organs and tissues could be created using bio-printing. Already, 3D-printed cells can be used in pre-clinical tests to produce early insights into the effectiveness of a drug or medical intervention. However, given the complexity of the body’s network of major blood vessels and capillaries — which support life by delivering nutrients and oxygen and removing waste — the bigger challenge is printing implantable organs and tissues. An important step was taken last year, when researchers from the Massachusetts Institute of Technology and the universities of Sydney, Harvard and Stanford succeeded in bio-printing an artificial vascular network. 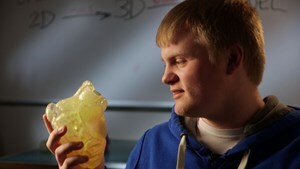 Of course, printing implantable human organs remains some way off. But while much excitement surrounds this possibility, 3D printing has another big advantage for the future of medicine: lower costs. The custom medical beads developed by Louisiana Tech University, for example, do not require expensive, specialised equipment. They can be made using any consumer printer.